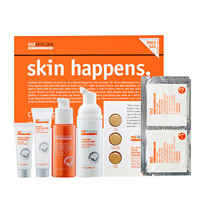 MD Skincare Skin Happens provides a kit with a cleansing foam, a facial peel, a blemish solution, a spot treatment, a moisturizer, and a sun block solution. As a complete package, MD Skincare Skin Happens Clear Up! Kit could either be the last skincare purchase you would need to make for a while, or a big waste of money. Which is it? We need to look at the ingredients to figure that out. They use various pieces such as an alpha beta daily face peel, a powerful sun protection SPF 30 sunscreen lotion, an all in one cleansing foam, a tinted moisturizer sunscreen SPF 15, and various others. We have to wonder if they are using all of these different pieces to distract from formulas that are too weak on their own or even in combination with each other to produce any greater results. This kit promises not only to treat acne, but also to prevent future breakouts based on ingredients like salicylic acid. There is no complete ingredients list to be found on any website we found. One retailer even admitted they did not have one available to them. However, they did name sulfur as one of the ingredients, which not only smells, but can also dry out the skin and cause irritation. We would recommend staying away from MD Skincare Skin Happens Clear Up! Kit. It doesn’t produce the results you are looking for, and they don’t even have the guts to give you the full information or any information that you might need to definitively see this for yourself.